Sylvia Kratins as Carlotta Grey and John Fisher as Sir Hugo Latymer in Theatre Rhinoceros’s production of Noel Coward’s “A Song at Twilight.” Photo Credit: David Wilson. Hugo Latymer, a crusty and aging English author, has taken refuge in a Swiss hotel, perhaps having worn out his welcome with his famous cohorts in London whom he abused in his tell-all autobiography. His only “friend” is Hilde, his former secretary and now wife of 20 years. Hugo’s quiet tranquility is disrupted when he finds he is to be visited by Carlotta, an actress whom he had mentored and bedded in their youth and who he hasn’t seen in decades. Theatre Rhinoceros’ revival of this 1966 Noel Coward play is rewarding. Somewhat daring for its time, the open discussion of homosexuality at a societal level is now a non-issue, but the closeting of it at a personal level still is. Thus, the central dilemma posed by the play remains relevant. At the time of its opening, many attributed the character of Hugo to reference Somerset Maugham, though it can easily be seen as Coward himself. When Carlotta arrives, we see a vibrant woman in contrast with Hugo, whose face and body reveal a greater toll. She has always resented Hugo’s disrespect for her, but her depiction in his autobiography became a public disparagement. Hugo may have expected her visit to relate to his book. What he didn’t anticipate was that she was completing her own autobiography and was seeking his permission to publish his love letters to her. While he could stop the letters’ publication, he couldn’t stop her references to his private thoughts that he so jealously guarded. A battle royal ensues, and in the process, Carlotta threatens Hugo with other revelations that concern him even more. The multitalented John Fisher directs “A Song at Twilight.” The set is handsome. Lighting and sound are basic, as they should be. The cast is first rate. This reviewer’s main reservation is Fisher’s own interpretation of Hugo. His flamboyance lends a bright lilt to the play, but at the expense of an appropriate characterization. We know that Hugo has concealed his homosexuality his whole adult life, even from his wife. Fisher’s flouncing about far exceeds what we would expect from a purported heterosexual – even an uninhibited one in the arts – or from Coward himself. That said, the performance was entertaining based on the actor/director’s intent. Although the character of Hugo considers Carlotta only marginally talented and unsuccessful in her profession, Coward endows her with rapier wit. Sylvia Kratins embodies Carlotta with total command — charming with small talk, but confident and piercing with innuendo and threat. Having suffered his condescension in the past, Carlotta repeatedly dresses down Hugo. Hilde’s presence bookends the action. A pre-war refugee from Nazi Germany, she is precise, organized, and decisive while managing Hugo’s affairs in the opening scene before Carlotta’s arrival. Away during the main debates between Hugo and Carlotta, she later returns tipsy and playful, and endearing to Carlotta. But when she grasps Carlotta’s betrayal, Hilde quickly turns on her and defends her man. Tamar Cohn executes each mood with absolute conviction in a sterling performance with just the right residual German accent. Noel Coward’s play is what we would expect from him – literate and clever and populated with characters of class and distinction. It is highly entertaining but grounded in matters of personal conscience and social consequence. This production captures these aspects well. 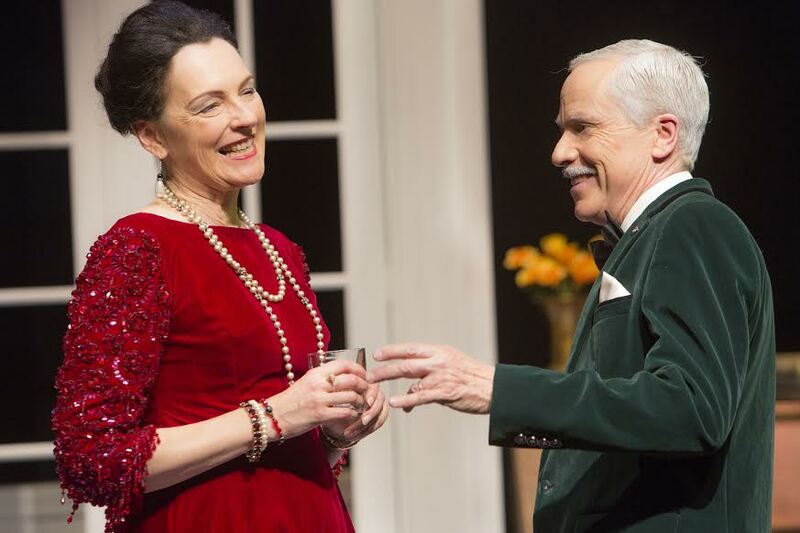 “A Song at Twilight” by Noel Coward plays at Z Below through January 31, 2016. For further information, click here. “A Song at Twilight” by Noel Coward. Produced by Theatre Rhinoceros. Director: John Fisher. Scenic Designers: John Fisher and Gilbert Johnson. Lighting Designer: Sean Keehan. Sound Designer: John Fisher. Costume Designer: Scarlett Kellum. Hugo Latymer: John Fisher. Carlotta Grey: Sylvia Kratins. Hilde Latymer: Tamar Cohn. Felix: Marvin Peterle Rocha. Posted in Reviews.Tagged A Song At Twilight, Charles Kruger, John Fisher, Marin Peterle Rocha, Noel Coward, San Francisco theater reviews, Sylvia Kratins, Theatre Rhinoceros, theatrestorm, Z Below.